ForumPiscine is the only trade fair of its kind in Italy for those in the pool, spa and associated industries. Exhibitors at the ForumPiscine trade show in Bologna, Italy, enjoyed a busy few days with visitor numbers up by 10 per cent on the 2015 edition of the show. 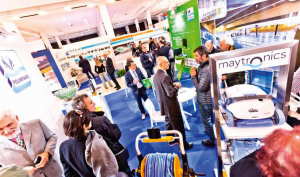 Some 150 exhibitor companies descended on the Bologna Exhibition Centre in February for the three-day show which is dedicated to swimming pools, spas and wellness. More than 7,500 visitors from across Europe and as far afield as the United States visited the show and made the most of over 20 free training workshops and seminars on offer. The bi-annual exhibition is the only trade fair of its kind in Italy for those in the pool, spa and associated industries. The International Congress was a highlight of the exhibition and visitors flocked to hear presentations on subjects such as commercial aquatic management, customer care and business management. The event was rounded off with the Forum Dinner Party, where exhibitors enjoyed dinner with guest speakers and entertainment provided by The Hangovers who appeared on the Italian X Factor.